Having a knitter come visit is pretty good times, I must say. It’s like an excuse to schedule in the normal pace of knitting-related leisure of, say, a month or two, all into a few days. See all the yarn! Visit the knit nights! Make more tea! Eat all the things! Over the last couple of days we have done a fair bit of all of the above. The added bonus of having an American visiting Canada for the first time is that it is a good excuse to eat things like poutine and call it, you know, a necessary task to check off on the to-do list. As a result Elspeth said to me yesterday, “you know, your blog post is going to be nothing but pictures of me with food,” and I said, “no no, some of them are pictures of you with yarn.” Admittedly I have not been the awesomest photo-documentarian this week but for when we stop long enough to eat things or knit things, but you know, that’s a pace I can live with. We’ve walked all over bits of Hamilton and downtown Toronto, seen Kensington Market and Queen St, and hung out with some knitters. And, lo and behold I’ve gotten Gwendolyn some buttons and we’re going to finally get her out for a photoshoot today. After 8 months of waiting I can’t just stick this sweater on a dress form and call it done – she needs a proper treatment. May you have a lovely Friday, dear knitters! Sounds like a great visit! I can’t wait to see your Gwendolyn FO shots! I want to be with you In Canada! How much does one of those foods cost in Canada? I want to see a picture of you modelling Gwendolyn! She sure looks pretty. And very complicated to a newbie knitter like myself. Sigh. PS – as a transplanted American myself, I loved your indoctrination – or rather introduction – of your American friend – to Canadian culture. Keep it up! She’s never had a butter tart??????? OMG, that’s criminal…. Elspeth is such a ham, but also a very good sport for letting you take pictures of her and share them with us. 🙂 I’m jealous of her whirlwind Canadian tour—I’ve never been myself, although my husband has. We hope to visit for a future anniversary. Is it silly to say that I’m loving those sleek buttons? I look forward to some oh-so-lovely pictures of Gwendolyn on her maiden voyage! I think the shop is Romni, Arlene. On Queen West at Tecumseh. yes! can’t wait to see a finally finished Gwendolyn! you must be feeling pretty good right now, especially after all that good food! Arlene – the shop is indeed Romni Wools! On Queen St. west of Bathurst. Can I tell you how much I want the plate of poutine?! Love some poutine! yummy! As for gwendolyn she will get done after the great eats and she will be lovely. Love the pictures! and especially Gwendolyn! beautiful! That teaser shot of Gwendolyn is *beautiful*. Can’t wait to see the full-on beauty photo shoot. I’m really liking the contrast bit on the button bands. 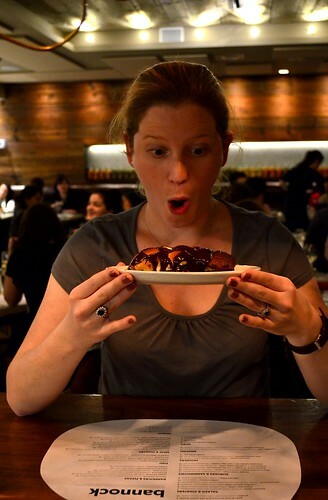 Please be sure to tell Elspeth that we are jealous of her lovely vacation/tour of Toronto. It looks like you two are having a *fantastic* time! Love the buttons you chose. Visits with good knit friends are the best! 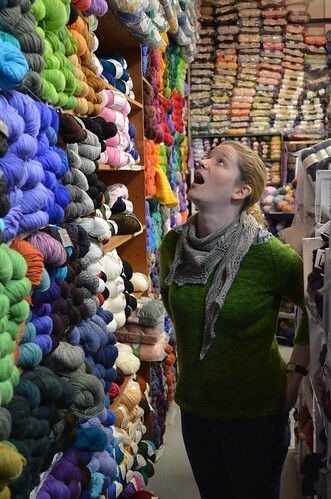 If I ever make it up to Canada, those yarn stores are definitely on my to-do list! Any chance random knitters could stop by. Poutine and butter tarts sound amazing and I’ve never been to Canada. Just a little fed up with the Midwest at the moment. Lovely sweater! And all that yarn!! Fun!!! 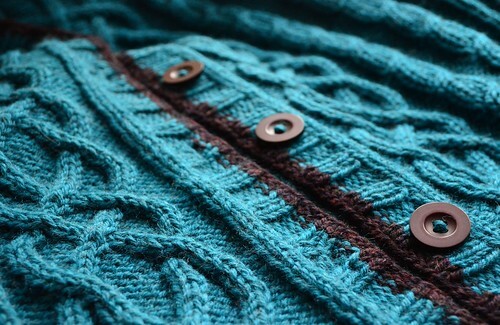 I’m with Eskimimi: I adore the contrast color on the button bands. And thanks to Hazel, I’ve been introduced to poutine. Love to eat; always mispronounce it, though. Not sure whether it’s funny or sad that I recognized Romni immediately…. Love, love, love the buttons, almost as much as that wonderful stripe of contrast color on the button bands. Excellent presentation of Romni. It was exactly my sentiment the first time I walk into the shop! Oh. My. GOD!!! 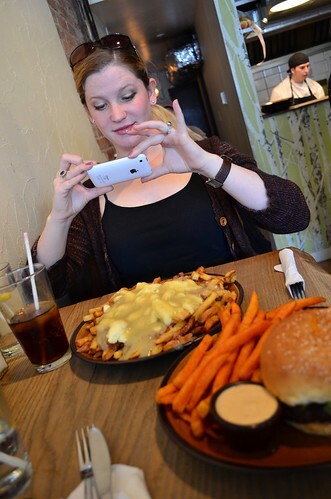 That poutine looks so freakin’ good!! !